So I posted on Facebook a week or two ago wondering if anyone would be interested in me writing about how I go about finding "old" royal fashion. This is not as easy because you cannot just go and look on websites like "Neiman Marcus" or "Wakakuu" to see what is new and find matches- you have to look on the depths of the Internet to find these pieces and often it can take you forever because you don't know the designer. It is quite frankly exhausting and can be very frustrating and disappointing if you do not have a system down. Make a Pinterest board or Folder on you computer of pieces you want to identify. So now I am going to discuss HOW TO USE EBAY TO THE FULLEST POTENTIAL. Yep- that had to be in caps lock- just really needed to emphasis that. First- start with your countries Ebay website- now I would suggest searching a designer- Say we want to look for a dress of Victoria's from 2010, we can look back at the already identified pieces of hers from that time and see that she wore L.K. Bennett a lot during that time. So we want to search L.K. Bennett and then click dresses. Now go down and make sure you have the Worldwide option clicked for shipping- this will widen your results. It may seem like a daunting amount of dresses to go through but truthfully it is not that bad. When you have finished those results- don't feel discouraged if you don't find anything- there is still more searching to be done. NOW (I really am a fan of caps lock tonight) go back to the side menu and check off Sold Items - yep- you can search items that have already been sold... SO HELPFUL. And if you get through that and want to continue searching for L.K. 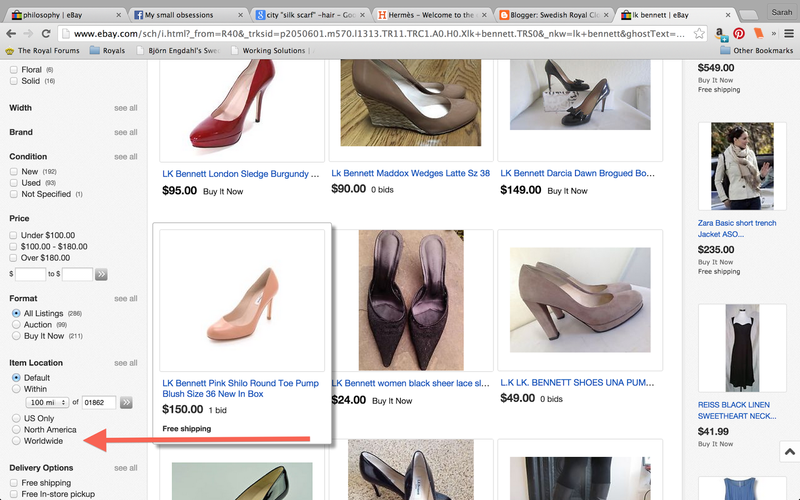 Bennett dresses, you can go back to the main page and scroll to the bottom and switch countries- this is currently my favorite feature. If there is a designer who hails from Spain- Spain's Ebay could hold more for you than say the United States. This is how I do my finds- also sometimes I find it to be better to set the sorting to be from Highest to Lowest so you don't get the knock-offs in the mix. Feel free to send any other questions or comments my way- I really love interacting with you all! Makes this fun for me!